CAPS membership is a fixed annual period from April 1st to March 31st. Please review all options below before renewing your membership. Chapter meetings are a great opportunity to experience the CAPS Advantage. We have 8 CAPS chapters across Canada. 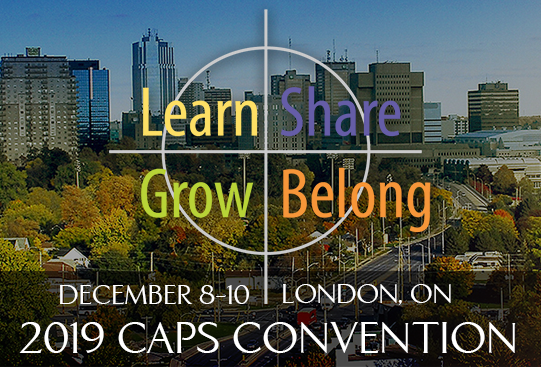 Experience the generosity of CAPS and discover opportunities to grow your business from within your own local community. Did you know Global Meetings and Industry Day takes place on Thursday, April 4th, 2019? It is a Day where members of the Meeting Industry get together around the world to celebrate, educate and promote the importance of Face-to-Face Meetings. CAPS is an important part of this Industry. Last year, there were 206 events in 41 countries that took place on Global Meetings and Industry Day (GMID), up from 122 events in 35 countries in 2017. Watch highlights from 2018. 2019 will be even bigger. Want to get involved…? I am looking for a few volunteers to join the GMID committee to spread the word about GMID across our industry across Canada as well as a few volunteers who would be interested in promoting GMID to our members and encouraging participation in events. The benefits – other than just the great feeling of volunteering and giving back, you will be working with and contacting those involved in our Meetings Industry including Meeting Planners, Destination Management Companies, Hotels and Conference Centres, AV Companies as well as Boards of Trade and Chambers of Commerce. It is an opportunity to be seen as a critical part of the Meetings Industry and develop contacts and relationships. If you are interested in volunteering, please click here to send me a quick email to volunteer@canadianspeakers.org with the subject: CAPS GMID and I will get in touch with you by February 4th. Because Meetings Mean Business. I look forward to hearing from you! The meetings industry is important to all of us! Canada ranked 6th out of the top 50 countries in terms of the Economic Impact of Business Events according to The Events Industry Council. The study sites that in 2017 Global business events generated more than $1 Trillion of direct spending, over 10 million in direct jobs and globally generated $621 Billion of direct GDP. The study also confirmed some economic drivers for Canada with $33 Billion in direct spend, 229,000 direct jobs and $19.3 billion of direct GDP. Business Events Coalition of Canada (BEICC) was founded in 2009 to advocate on behalf of the Business Events Industry in Canada. The BEICC was a coalition of Associations whose members all work in the business events industry and we are proud that CAPS was a founding member and our own Bob Parker, CSP was instrumental in establishing the coalition and its by-laws. We are thankful for the work that Bob did and for pushing for CAPS to have a seat at that table. In 2017 we signed a licensing agreement with Meetings Mean Business Coalition (MMB) in the US and changed our name to MMBC, Meetings Mean Business Canada. Meetings Mean Business US is a large and successful coalition with a board of 50 industry-leaders and $1 million in annual core funding. They have a powerful resource toolkit that provides industry data and evidence of the importance and economic impact of in-person meetings. We will be able to leverage the success of their model, their resources and their reach. Since the coalition launched its rebrand from BEICC to MMBC in January 2017, MMB Canada has raised over $100,000 of initial funding and counts over 130 industry executive leaders amongst its supporters to date. The Meetings Mean Business Canada Board is set to continue its mission to advocate for the power of face-to-face meetings and to connect with Business Events Industry Leaders. How will you celebrate Global Meetings and Industry Day April 4, 2019…? The leading Canadian resource for experts who speak professionally including keynote speakers, trainers, coaches and facilitators. We are a growing community embracing the CAPS Advantage: Learn Share Grow Belong. You can reach us through various ways, either through the following contacts or through social media below.